We've been making the most of the recent sunny days with lots of outdoor play, nature hunts, & paddling pool fun. With the roses blooming rapidly in our garden & some petals already starting to fall, Minnie, was keen to add these to her pool. As she sprinkled them over the water I started to realize what a neat, natural science activity this was. As the petals floated on the surface of the water we noticed how the sunlight hit them creating some amazing shadows to explore at the bottom of the pool. With her imagination Minnie saw butterflies, dragons, & more in the beautiful shadows & loved creating more shadow shapes with her hands. 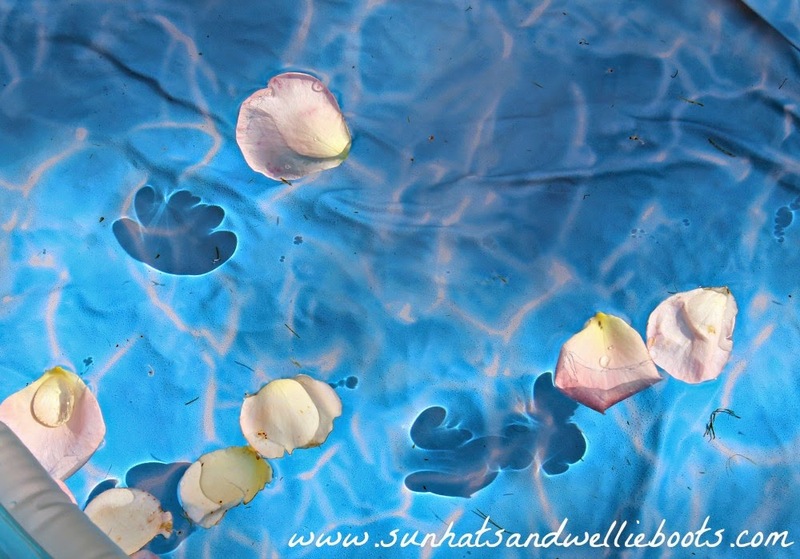 This relaxing & calming time of just watching the petals didn't last long, the pool of water was just too tempting not to jump in! So in she went! 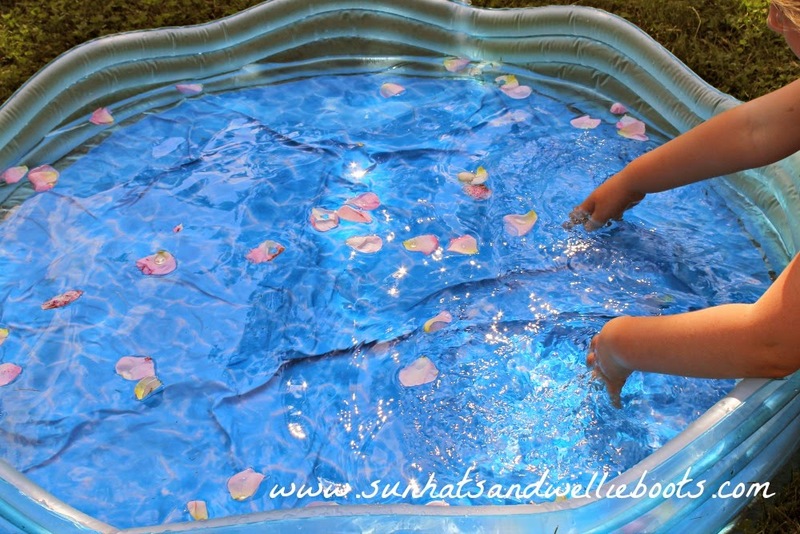 But what a cool way to explore the behaviour of objects in the water! What does the water feel like? Look like? How does it make you feel? Then she invented her own game; how many petals can you catch on one foot? Great for exploring balance & co-ordination, & a neat way to practice a little maths too! 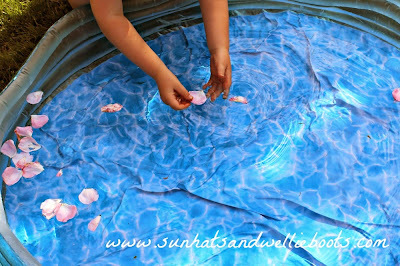 This was a great activity for encouraging concentration as she really had to focus on how her body moved through the water to 'catch' the petals. She discovered the faster you go the less petals you'll catch, & in the end this became a very relaxed, calm activity. 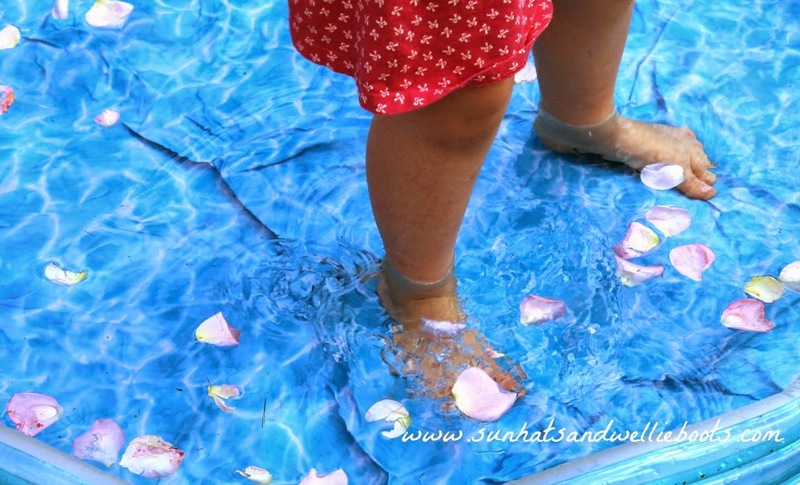 This calming free play with just rose petals & water is something I'm sure we'll be exploring again, especially on those hot summer days when we can all feel a little frazzled.